“Preferably, an engineer should attend art college, while an artist should know how to engineer.” That in short was Koert van Mensvoort’s statement when asked how designers and artists should operate in a technology-based society and how they could contribute with ethical, moral and political views within the discourse of the relationship between humans and technology. However, if you look closely to the work of Van Mensvoort, there is even a more intricate approach to ethics when it comes to design research: it is all about enabling participants to form and share their own opinion. As a prelude to the Willem de Kooning Academy (WdkA) Design Research Day on September 23rd 2016, I invited Techno-Philosopher Koert van Mensvoort to give a talk on his design research and to take part in a discussion on the subject of the relation between humans and technology and the role a researching designer could play in this discourse. The goal I had for this conversation was twofold: Primarily, I aimed at positioning my own design research within the context of Van Mensvoort’s design research. Where Van Mensvoort manages to start dialogues by exploring possible future applications of nanotechnology through his well known and thought provoking Nano Supermarket products, my own design research is more aimed at creating awareness on the duality of trust in online devices and services. My main question was: What role can designers play in the discourse of ethical technology? Secondly, since we were kicking off the WdkA Design Research Day, I aimed to have a conversation with Van Mensvoort on the role of a the researching designer – or: designing researcher – and I invited the audience to take part in that conversation in order to try to shed new lights on what design research should be, should and should not do. While introducing Koert, I gave a short keynote on the design research I conducted; especially focussing on my smartphone probe research. During this introduction, I stipulated the fact that the speed of technological development has been increasing dramatically over the last 70 years and that computers have become both almost incomprehensible powerful as practically invisible. Besides, operating these powerful machines has become almost effortless and this lack of effort causes problems in itself; which I explained by showing some results of the research probes I collected in the months before. This turned out to be a well chosen ‘hook’, as Koert gave his lecture on the relation between humans and technology from his well known perspective as a speculative designer and philosopher. While speculating on the possibilities of nanotechnology in the near future, Koert sketches an image that can be considered both utopian and dystopian. Some of the speculative products he proposes can be considered as ‘wannahaves’, while other, like the ‘in vitro meat’ proposal, are much harder to stomach. Would you be prepared to have lunch with your fiancée and eat a hamburger made from cloned cells of her body? What is really interesting, is that although these fantastic sci-fi like products mostly originate from speculation based upon our present knowledge and ethics, Van Mensvoort uses a clear construct for his theories. He states that technology is what makes us human, and that the acceptance of technology is based upon a model of perceived naturalness of that technology. Because we accept technology as ‘normal’, the more ‘natural’ it becomes to us. From that perspective, he proposes his idea of “Next Nature”: man made technology based nature. A Technosphere, in addition to the Troposphere and the Biosphere. Then again – and that is where Van Mensvoort is at his best – these products and views are mere proposals, speculations and thought provokers. Van Mensvoort ask questions and proposes ways of thinking, but never claims to be an advocate nor an opponent of these possible future implementations of technology. 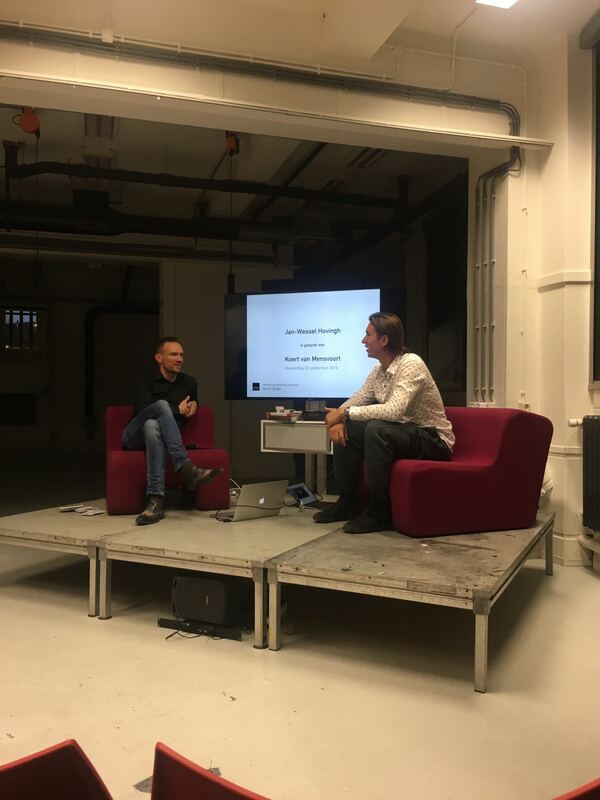 During the conversation following his lecture, I asked van Mensvoort how a designer should conduct research and what the role a designer could have when conducting design research. I also wondered how a designer could remain more or less independent when asked by companies and organisations to conduct research or to do proposals. Should a designer impose ethical guidelines when running these projects? I wondered what was Koert trying to achieve when proposing his sometimes outright bizarre products. It turned out some people in the audience were under the impression that Koert was actually promoting and advocating the products he proposed, as a de facto techno-optimist. From that perspective, one could argue Van Mensvoort positions himself a technological determinist: technology determines society’s values, and not the other way around. But, as it turned out, Van Mensvoort is neither of the two. By creating Nano Supermarket, he speculates on the possible future adaptation and implementation of present (theoretical) technological innovations but he does not judge them. By framing this possible innovation in products that people can envision to buy and use, he asks questions and provokes discussion. This debate is part of the service and product he provides. As Van Mensvoort stated during the discussion: “I always ask myself this question: does this specific technology enhance or deteriorate my humanity? The answer to that question is personal and different for every individual. So in the end, Van Mensvoort never provides an answer to these questions. Instead, his participants and audience do. Although Van Mensvoort never openly judges the proposals he makes, it is not about providing ethical frameworks or creating a moral high ground either. It is all about asking the right questions by creating the right context in order to let the participants draw their own conclusions and recording them. Although I was familiar with Van Mensvoort’s work, the evening brought me new insights nonetheless. Especially on the subject of the role of a researching designer in the context of ethics and ethical design. I assumed it was all about providing ethical and legal frameworks but Van Mensvoort’s approach is much more powerful. By proposing a certain (near) future context with speculative products and services based upon contemporary technological concepts, he invites his public to reflect on their possible relationship with these products and services. This inner reflection alone is enough to start an ethical debate and these debates are highly necessary if we aim to live in a world with truly human centered technology.